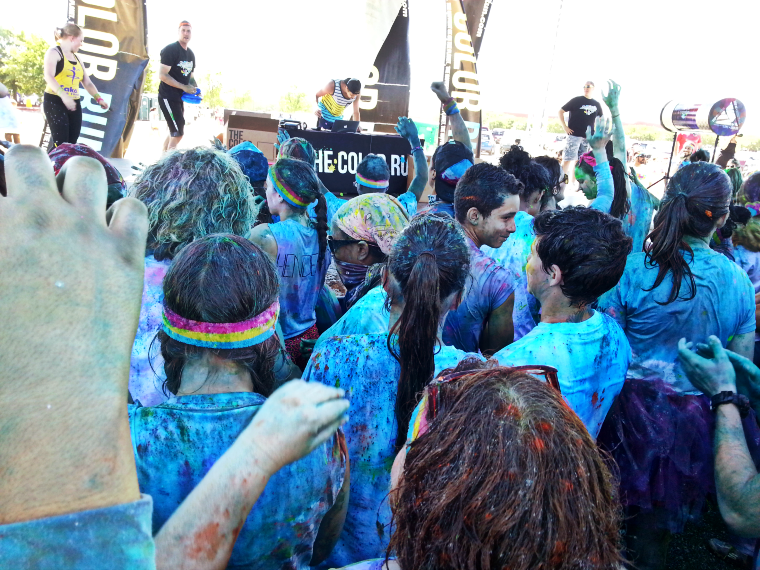 We came. We danced. 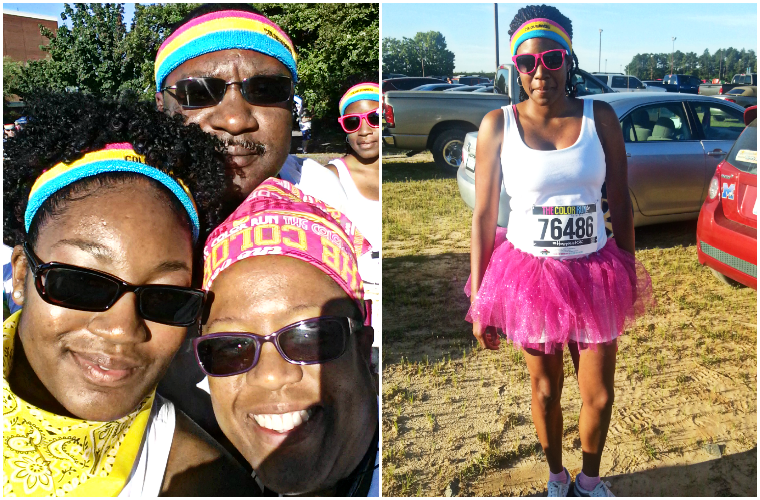 We ran. And it was amazing. 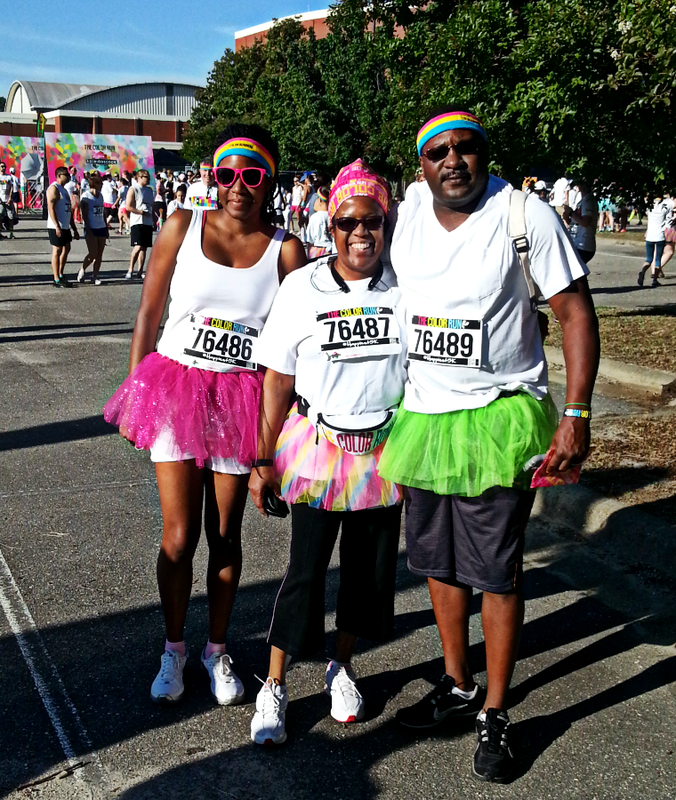 This year I switched it up a bit and ran with my parents and sister. 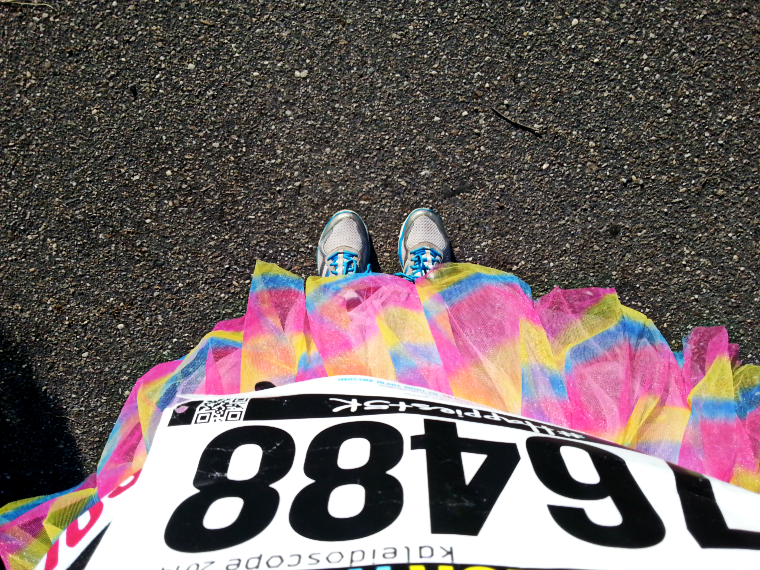 It was my first 5k of the year, and their first 5k ever. 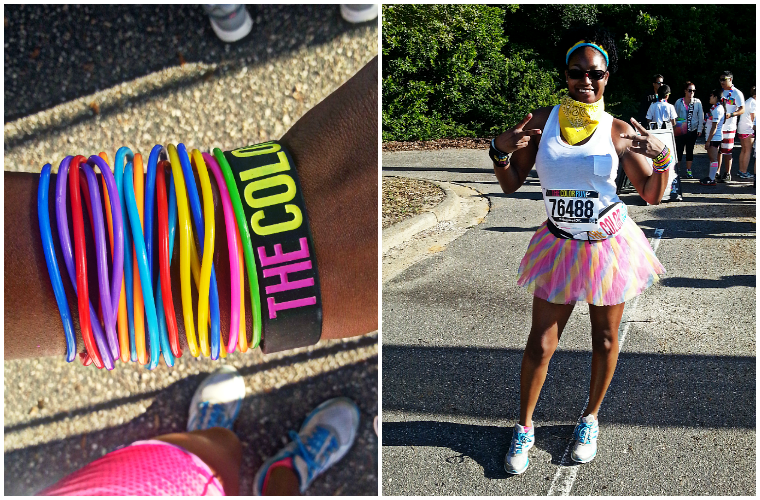 Although I was completely terrified I'd keel over a mile 1, I somehow managed to make it the entire 3.1 miles--uphill, downhill, through the crowds of people and all four color stations without stopping. 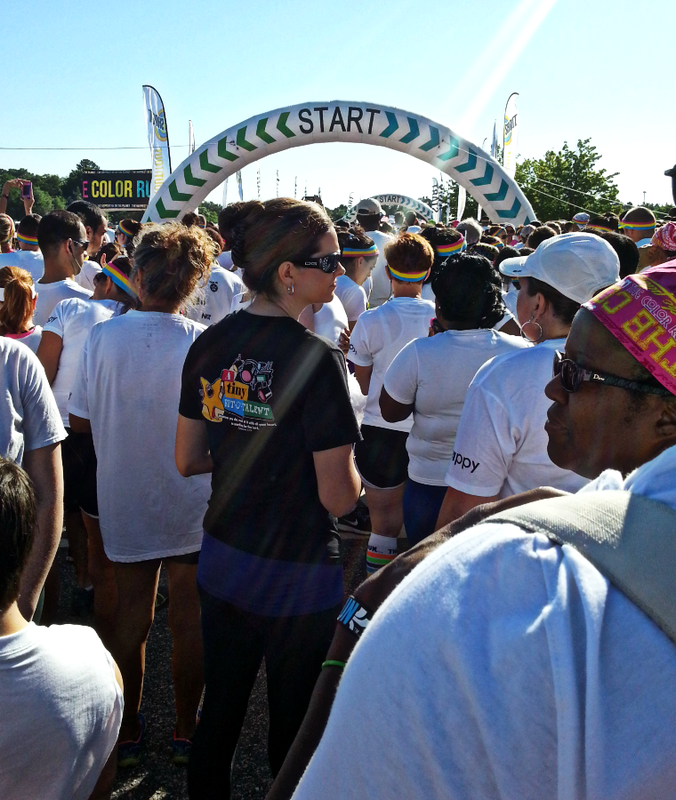 The one thing that I've noticed about The Color Run, is that it truly gets better with age. 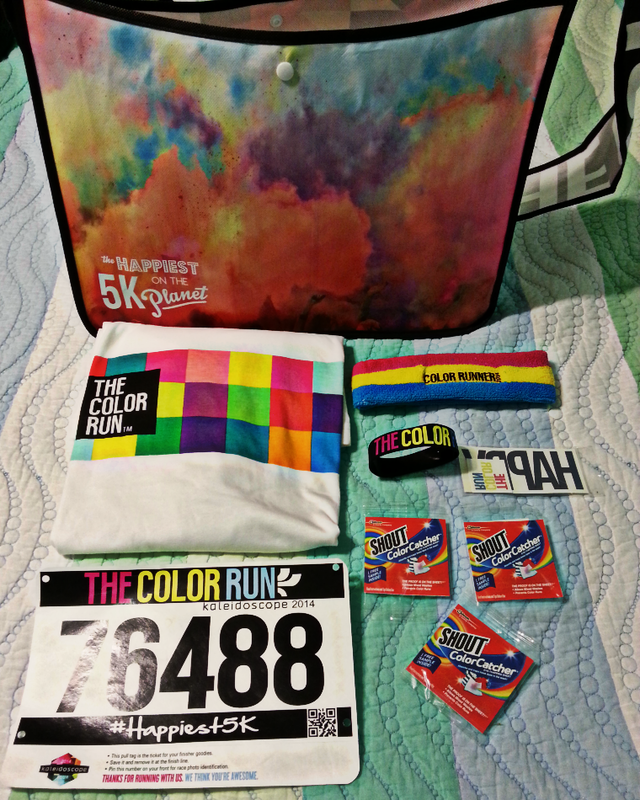 The last time I ran was equally as awesome, but this time around they had more goodies for the participants. I think after a few years of seeing what worked and what didn't work, a few changes were made. The gear was even better this time. 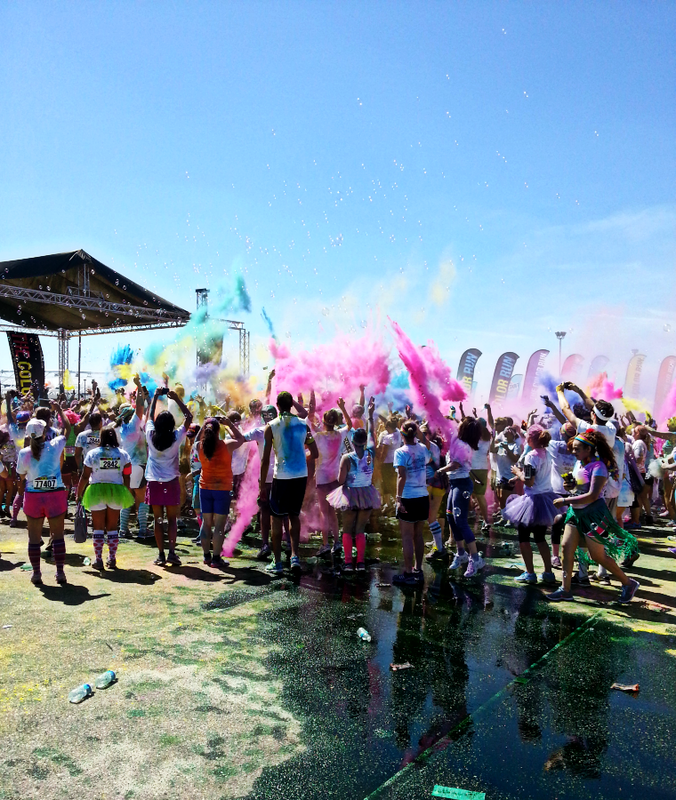 I plan on very proudly rocking my Color Run t-shirt all summer. 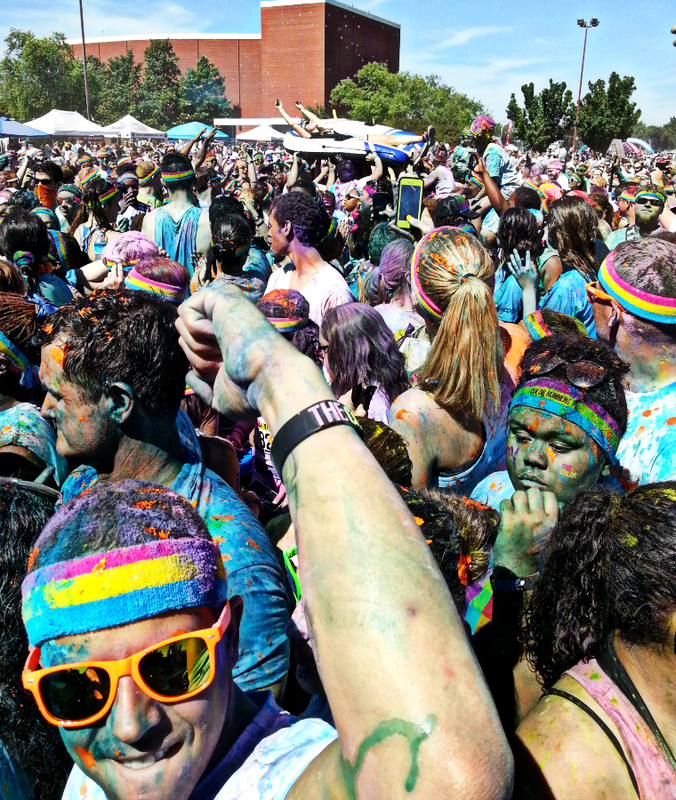 I'm not going to bore you guys anymore with the details other than to say that The Color Run is AMAZING and it's something that everyone should experience at least once. 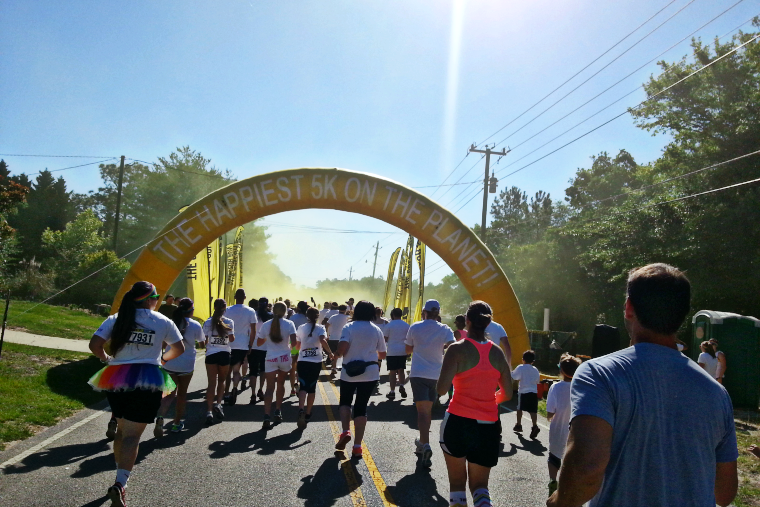 Since a picture is worth a thousand words, these photos will do The Color Run justice. Seen enough yet? 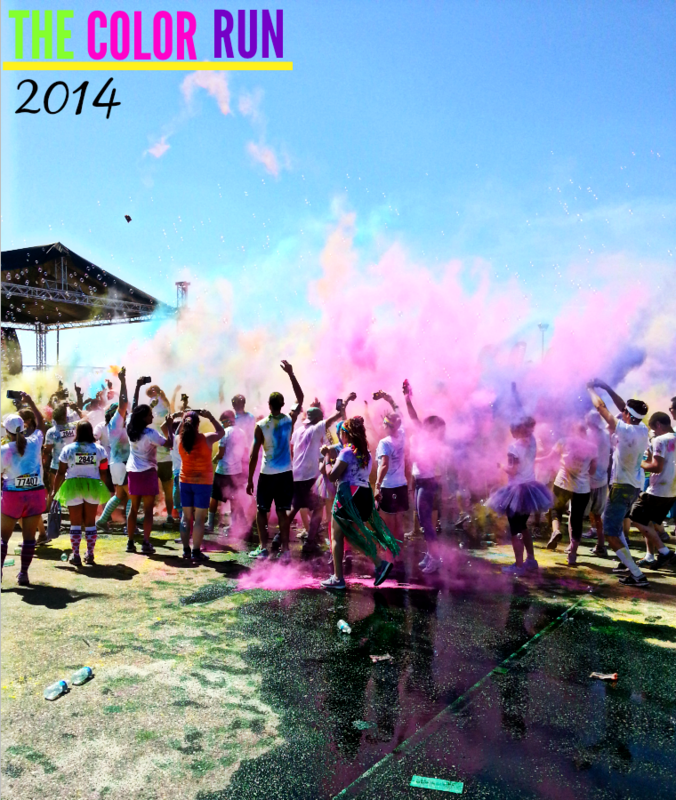 Be sure to check out the schedule for The Color Run. Who knows, maybe they'll be coming to a town near you. If so, get your tickets early. It always sells out. Fast. I've been busy stockpiling some new free printables for you guys. Today I wanted to share something that I strongly believe. Two years ago, I would have scoffed at the idea that I could seriously make money blogging. But then one day I just decided that I could and I would--and then something amazing happened--I did. All it took was for me to realize that I wanted to earn money doing something I truly loved, and I found a way to do it. You can too. Dreams are so beautiful, and yet so fragile. All it takes sometimes is one negative thought or voice to shatter yours. Today I'm saying don't let it happen. 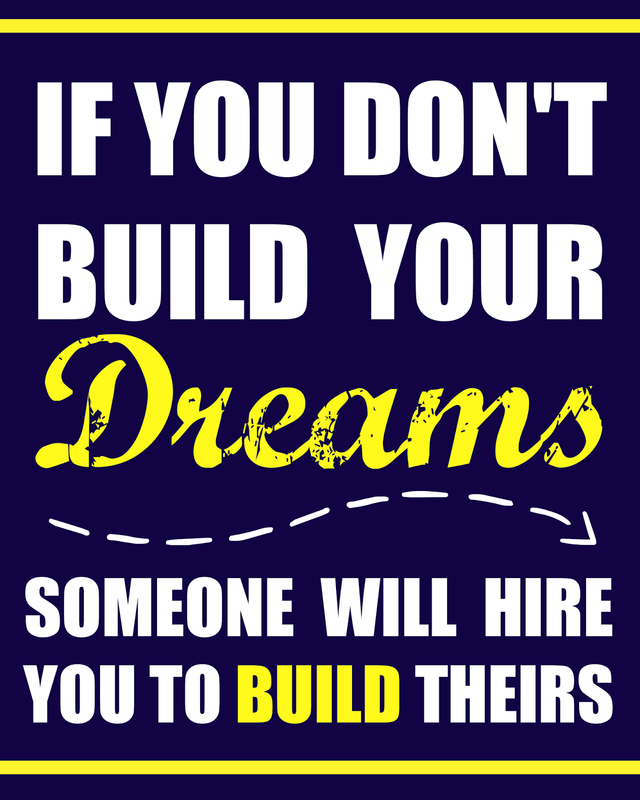 Fight for your dreams because if you don't, someone will pay you to fight for theirs. Enjoy this free printable. And keep on dreaming! If you live in North Carolina, you know that lately the weather has been a bit bipolar. A month ago I caught my first case of laryngitis. For the first few days, I enjoyed my Sophia Bush-esque voice. But then my voice completely disappeared. A few days after that, Little J started getting the sniffles. Before I knew it, we were at defcom-three. We were all sick and cranky. Enter my famous chicken tortilla soup. My solution for the ickies. Basically, this is chicken soup on steroids. It's great if you're feeling under the weather, and it's a tasty solution to the overdone chicken soup. It's also ridiculously simple. And now for the instructions. Take notes because this one is going to be a doozy. Toss everything into the crockpot. Cook on high for 4-5 hours. Shred chicken. Stir well. Serve either soft of crunchy tortillas and a smile. Like I said, ridiculously simple, but unbelievably delicious. What is your go-to meal for battling the ickies? 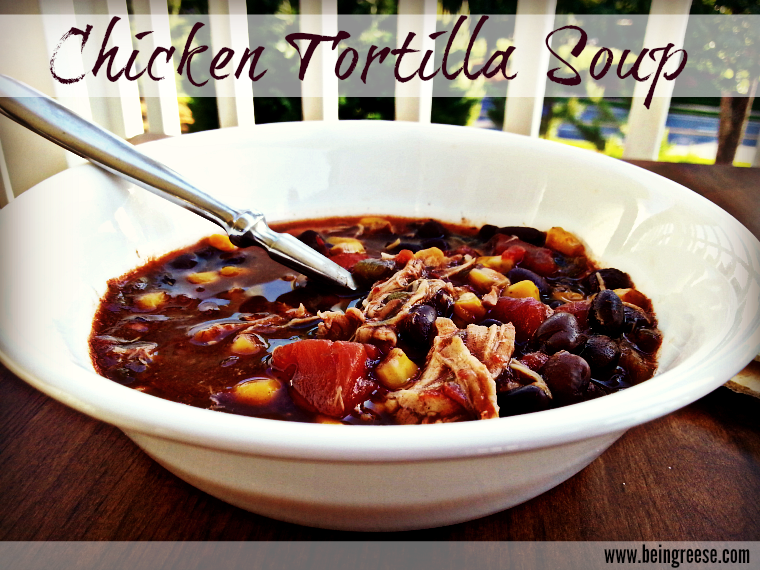 Have you ever tried chicken tortilla soup? As always, if you try out this recipe, come back and let us know how it turned out. Until next time. A while back I mentioned the increase in opportunities I've received in the past few months. One of those amazing opportunities was an invitation to be a SwimWays Swim Steps Ambassador. As you can imagine both Little J and I are very excited. Our family has been a long-time supporter of SwimWays and believe very strongly in encouraging children to learn to swim at a young age. With Memorial Day and plenty of trips to the pool in the near future, we are working to ensure that Little J knows how to swim this year. 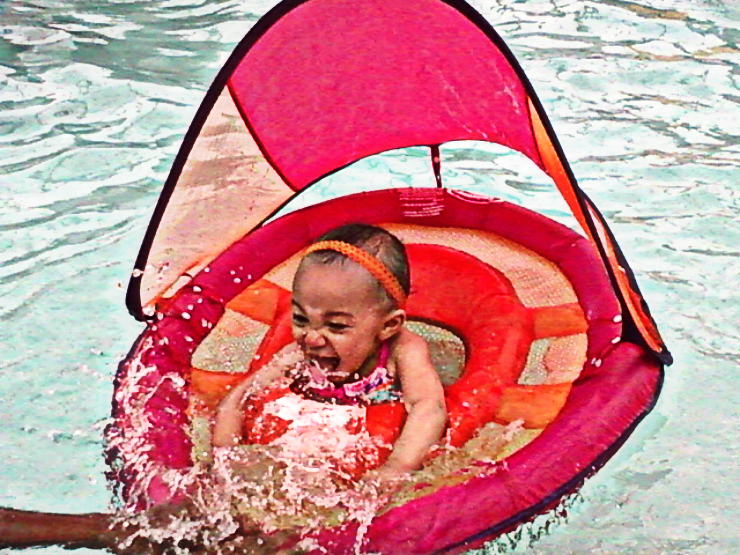 According to the American Red Cross, drowning is the second-leading cause of unintentional injury-related death for children ages one to 14. As a parent, that number is terrifying. Today, however, we are hoping to unite and decrease that number--in a big way. Today marks the Third Annual National Learn to Swim Day and I'm asking you to get out and participate by taking the time to introduce your little ones to the water. For the next few months, I'll be sharing tips, advice and news on Swim Ways products with you guys. If you have any questions, please feel free to ask. Remember, we're all in this together! Now get out there and have a "water-ful" day! Note: I was given products for this post, however, all thoughts and opinions are mine alone. As you can see in the first image, my family has long supported Swim Ways. 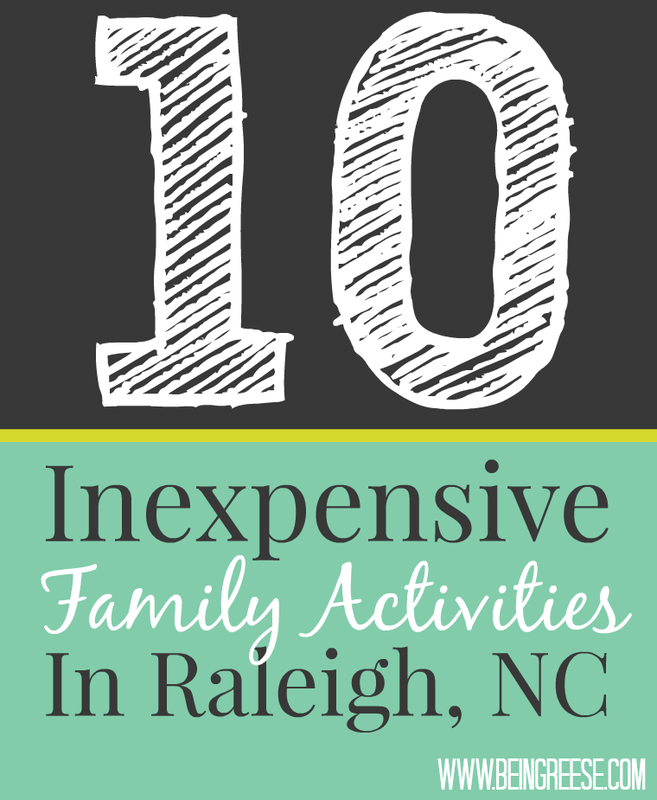 As the long anticipated summer season rapidly approaches, parents in the Triangle are taking to the internet in search of some inexpensive ways to keep the kiddos entertained this summer. To help make your jobs easier, we've put together a list of some of the best budget-friendly attractions around town! 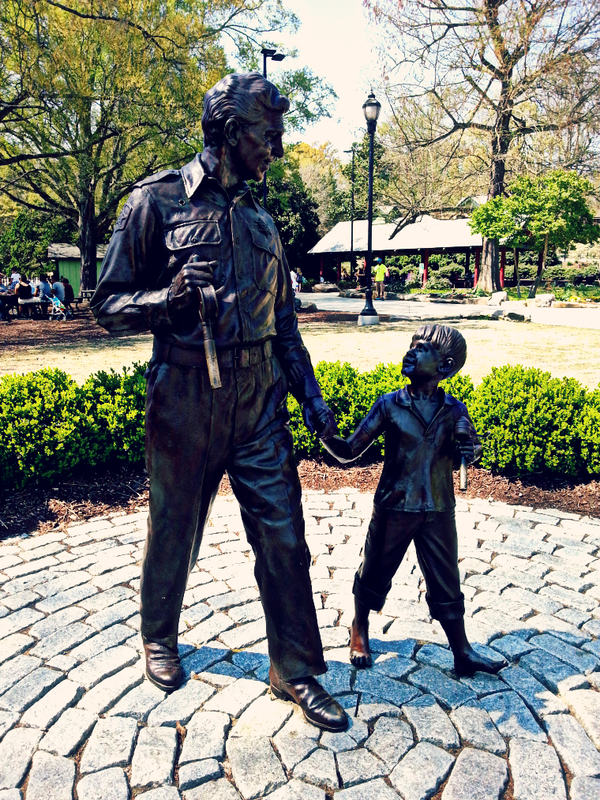 These 10 places in and around the Triangle offer families an affordable opportunity to spend some quality time together without breaking the bank. I'm such a fan of the cheap movie theaters. While some may turn up their noses, I revel in the fact that I'm able to find such a budget-friendly alternative to the vastly overpriced "regular" theaters. You and your family can catch a flick here for $2.25 per ticket. With all the money you save from your tickets, you can actually purchase snacks without feeling too guilty. The Henderson Drive-In is something of a landmark around here. While there not quite as close as I would like, in the long run, it's a fun experience that all families should try every once and a while. Bonus: what you spend in gas, you will most definitely save in theater tickets. I heard about Mables Kids Museum (MKM) long before moving to Raleigh was even a possibly. Most people who go rave about the experience, and the kids always want to go back. The best thing about the MKM (besides the fact that it's a great learning resource for kids of ALL ages) is that it's inexpensive. Admission is $5 per person. Kids under the age of 1 and members are free. Curious about the cost of membership? Let me save you the trouble. The family basic membership will cost you $100 a year. For your entire family. And you get all these added perks: Free general museum admission for one year. Special discounted pricing for all IMAX documentaries with no online ticketing fees. Invitations to members-only events and exhibit openings. Special discounts in Marbles Corner Store, in Pogo Cafe, on birthday parties and for enrichment programs like camps, classes and more. Early registration for our award-winning summer camps. Advance ticket sales for popular events Advance seating for IMAX movies I'd say that's well worth the cost! We discovered this little gem in Charlotte, and were beyond excited to see that they have a location here in Raleigh. Although it's certainly no Disney World, it's a great place to spend those hot summer days without breaking the bank. Although activities vary based on location, in addition to 50+arcade games, the Raleigh Adventure Landing has: Miniature Golf Laser Tag Go-Karts Batting Cages Prices vary, but most activities will cost you $8. Plus they offer military and senior citizen discount. Bonus.They currently have a web coupon for 70 arcade tokens for $10. Sweet. Honestly, if you ask me, Frankie's is actually the better deal. Not only do they offer more attractions, but it appears the facility is kept in better shape. (Sorry Adventure Landing). Frankie's has: Various go-kart courses Batting cages A fun house Bumper boats A sky web A sky trail Miniature golf Lazer tag Tons of arcade games and even a few rides. They also have two dining areas, and the prices are basically the same, if not cheaper, than Adventure Landing. Don't feel like making the drive to Henderson for the drive-in? Here's a solution. Movie by Moonlight is outdoor movies series hosted by WakeMed that takes place throughout the summer. Tickets are only $3 per adult. Kids ages 12 and under get in free. That's a pretty sweet deal! Even better still, some of the proceeds go to WakeMed Children's Hospital. That is definitely a win-win. Concerts take place from 5 p.m. to 10:30 p.m. on Thursdays, beginning the Thursday after Memorial Day and ending the Thursday before Labor Day. This is an awesome way to get in some great music, taste some great food and spend time together as a family. Oh and did I mention it's free? Though I'm typically not a fan of aquatic centers, I'd be remiss if I didn't mention this budget-friendly activity. The aquatic centers here in Raleigh actually aren't quite that bad. There inexpensive, well-kept and they have plenty of activities for children. The first time I heard of an art/gallery walk, I was living in the tiny town of Fayettville, NC. Mr. A and I had just started dating, and frequently went downtown to enjoy the sights and sounds of our small little town. Flash-forward four years later and gallery walks are still something we like to do. For one night, the whole city comes out to celebrate the rich arts and culture scene. This can be a great place to bring your family to unwind and kick off the weekend. So, are there any places I neglected to mention? What are some of your favorite places to hang out in the RDU area? 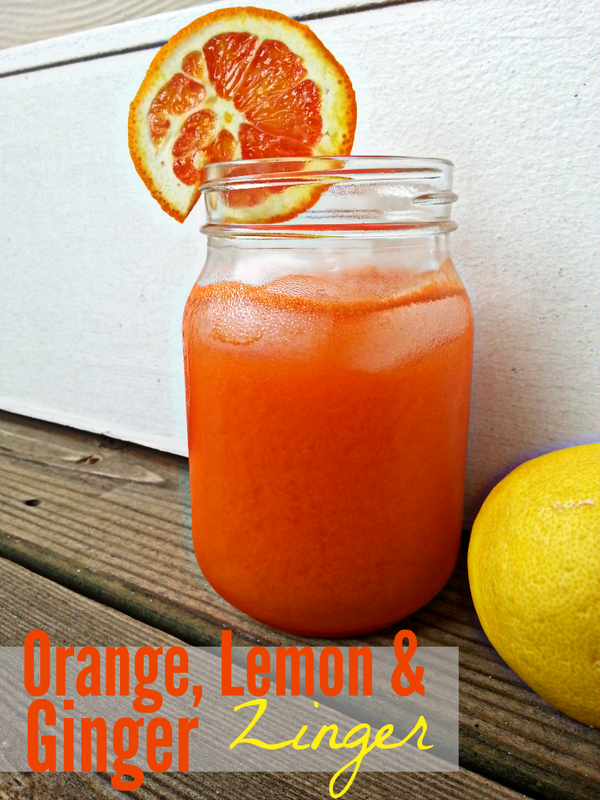 Refreshing drinks are my favorite part of warm weather. During the long summer months, there's nothing more relaxing than sitting in the shade slowly sipping on a cool drink. After watching Fat, Sick and Nearly Dead last year, Mr. A and I have made it a point to make our own fresh squeezed fruit and vegetable juices. We've been doing this for more than a year now, but nearly every week we discover a new combination to add to our ever growing list of favorites. In addition to being lip-smackingly tasty, this latest recipe I've come up with has some amazing health benefits. To make this easier to digest ::pardon the pun:: I've broken each of the benefits down by ingredient. As you can see, this powerful drink packs quite a wallop. I do want to caution that if you are looking to juice to loose weight, you'll want to be mindful of the amount of fruits that you include in your juice. Although they're certainly healthy and a necessary part of our diet, fruits contain quite a few calories. 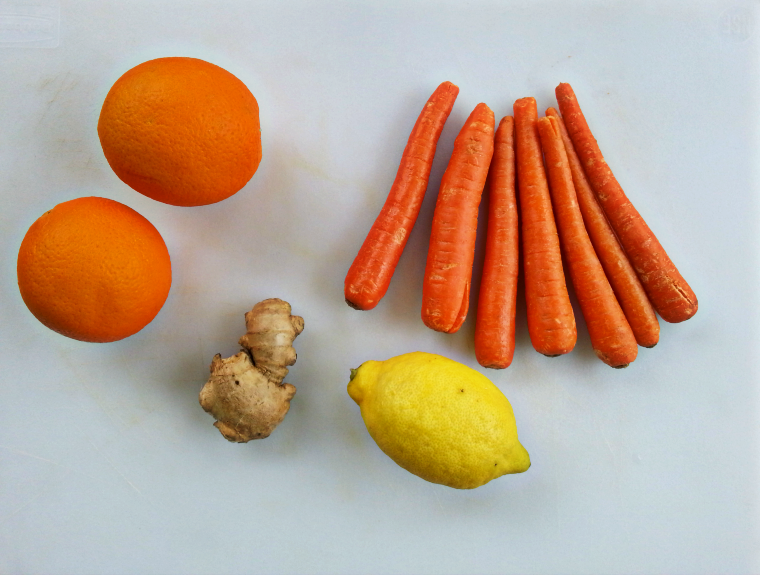 Wash produce thoroughly, then remove the peels from the oranges, lemon, and ginger. Toss into the juicer, and enjoy. It's as simple as that! In case you're curious, we have the Breville Juicer, which is the same juicer that Joe uses in the documentary Fat, Sick and Nearly Dead. As I said, we've had this model for more than a year and we haven't had any problems. It's definitely a great starter juicer. As always, if you decide to give this recipe a shot, come back and let me know what you thought! Until next time. 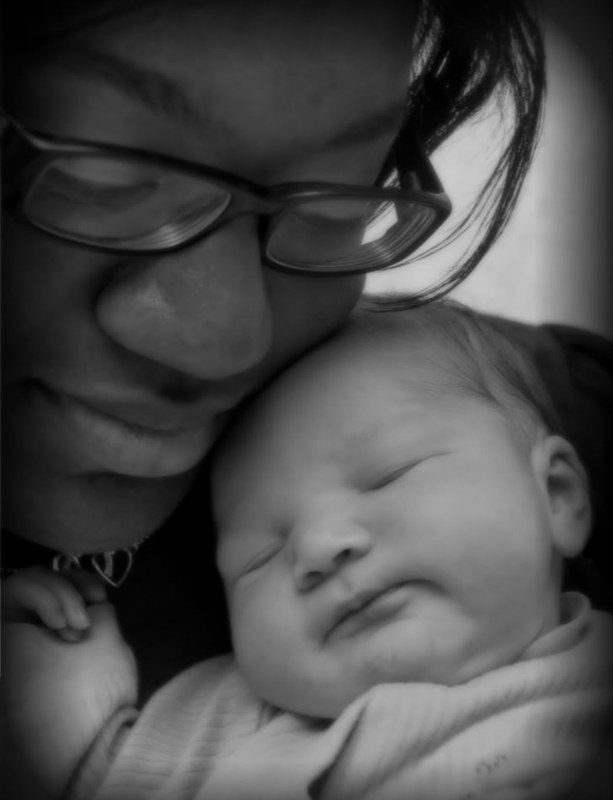 Congratulations new mothers, expecting mothers, and mothers who have managed to keep their children alive thus far. You have done an amazing thing. Probably the most important thing you will do in your life-- granted you don't discover a cure for cancer or prevent an asteroid from smashing into the planet. If you're new to this crazy train known as motherhood, I'm going to prepare you for something you will inevitably encounter along your beautiful journey. You are going to hear every variation of "you're doing it wrong," you can possibly imagine. It will typically be cloaked under the guise of seemingly well-meaning advice or statements such as, "well, I did it THIS way and my child turned out fine." And congratulations super mommies, you've done a truly wonderful thing by raising such a special gem. But this post is not for you. This post is for us mere mortals whose normal children pitch temper tantrums at inappropriate times and feed their vegetables to the dogs when we're not looking. All sarcasm aside, it appears some "veteran mommies" are suffering from long-term memory loss. I love you mom, but I know for a fact I wasn't the angelic child you so lovingly reflect upon. Remember that one time I was grounded all summer and you had to work? Instead of staying indoors like you told me, I snuck outside every day. When you called to check on me, I had the cordless phone with me and I would dash back to the house to answer the phone, pretending I was glumly serving out my punishment from the confines of our home. I really wasn't. 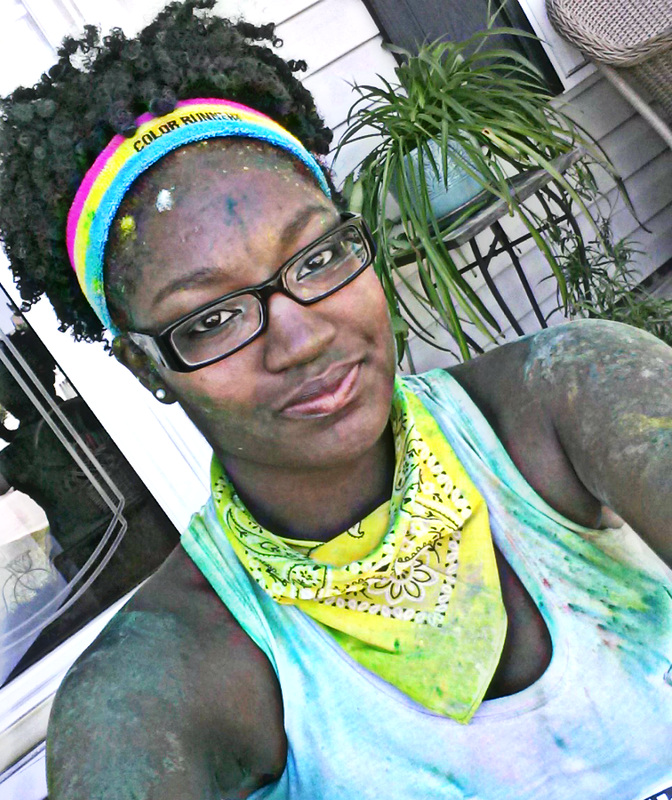 I was having an awesome summer. Sorry about that. To all of you mommies, I see you struggling in the supermarket with your wailing toddler. Ignoring the glares from onlookers who are muttering, "my kids know better than to behave like that in public." I understand you. In fact, just yesterday I was you. And that's why I know there are so many reasons why your child is misbehaving, and equally as many reason why you may be letting them. The crux of humanity is that it allows us only to truly know what is happening in our own lives. We know nothing of the lives of strangers. Though we can occasionally catch a small glimpse of a brief second of a tiny fraction of their lives, it's not enough to understand what they may be going through. It's definitely not enough to use to judge them for. Or it shouldn't be. Motherhood is not a competition. And contrary to the belief of the mother in front of you, driving the minivan peppered with the 'my kid is on the honor roll' bumper stickers, you don't receive a trophy or gold star for creating an awesome child. This isn't to say you shouldn't strive to raise an upstanding citizen, we all should. But the simple fact is what works for you may not necessarily work for another. And it has taken me three years and a lot of stolen moments spent sneaking Snickers Bars in the closet, feverishly praying for Mr. A to return from work for me to come to this realization. There is one basic and universal truth about motherhood--it's hard. All the parenting classes in all of the world cannot possibly prepare you for it. You can scour every book in the parenting section of your local bookstore and sign up for every baby website, but it will never be enough. No book can accurately describe the level of sleep deprivation, anxiousness and absolute joy you will feel looking at your children--sometimes all at once. Maybe the next time you see the lady in the store with the rambunctious children, instead of judging her, you'll give her a reassuring smile. 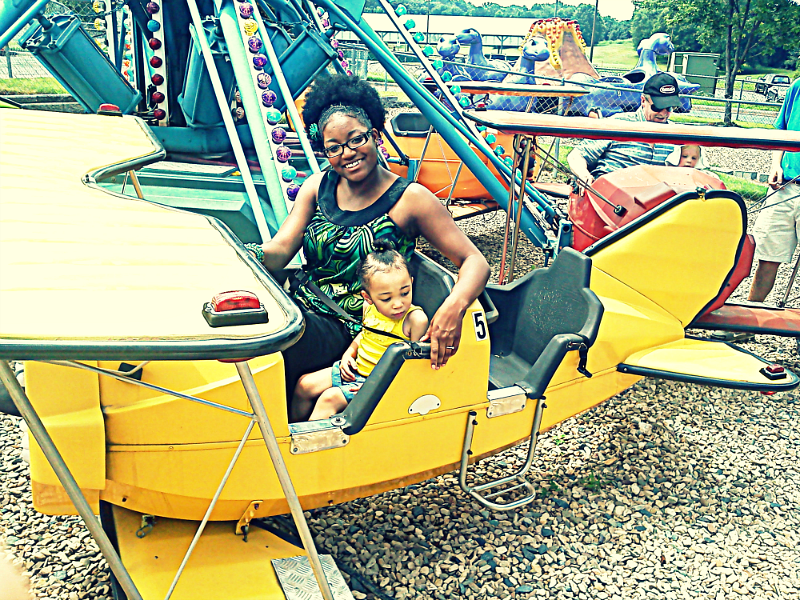 Motherhood is hard enough without the added pressures of dealing with the disapproving looks and snide remarks. And quite like that annoying song from that Disney musical, "we're all in this together." So for every mother everywhere that has accidentally left the diaper bag home, snuck a candy bar in a closet while playing hide and go seek with your toddler, or are convinced that your child will need therapy later in life because that one time you left them at the grocery store, you are not alone! Happy Mother's Day to all of you amazing ladies. Enjoy that one special day out of the year that we all pause to pay tribute to the incredible women who have helped mold and shape our lives!